I had some down time before my wedding, so I made sure to price out alterations considering the work I needed done. She sewed 175 crystal buttons down the train of my dress y’all! First, Jane beat all seven of the other alteration places I priced out in San Antonio (Everyone else I asked charged $2-$3 PER button). Second, her turn around time was impeccable (buttons included) and she also did some of my girls dresses! Lastly, her online booking system was so easy and made the communication process so much better. 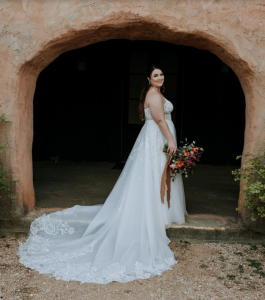 She was also confident working on my designer dress & dress straps and made sure it fit my body in a flattering way for all those up close detail shots! Thank you Jane, you were such a vital part of making the wedding planning process and budget less stressful. My wedding dress and my mother’s dress fit perfectly. My bustle came out beautiful–she really thought it out so that it accentuates the train. Jane did an amazing job on my dress! 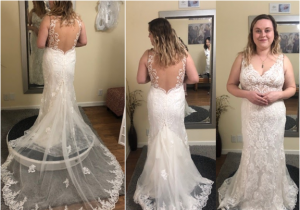 I wanted extra fabric added around the chest for more coverage–she found the perfect lace to match and did such a good job that you can’t even tell the dress didn’t come like that. She also noticed things that needed altering that weren’t even on my radar, and she executed them perfectly. My bustle came out beautiful–she really thought it out so that it accentuates the train. Her prices are SO reasonable for such excellent quality work. I highly recommend her for wedding dress alterations! If you need alterations on your wedding dress, Jane is definitely the person to trust with it! Jane is simply PHENOMENAL! 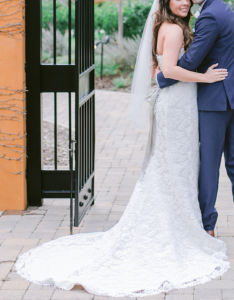 My dream wedding dress was lace and was WAY too long for me, but Jane hemmed it for me and it literally looked perfect – you would never know anything was altered on the dress, the lace pattern remained flawless! She also added a bustle that you couldn’t see at all but even my wedding planner said it was the most straightforward, easiest bustle she’s done on a wedding day! Her prices were more than fair and extremely competitive. 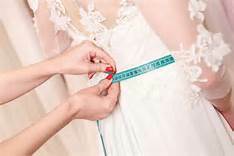 If you need alterations on your wedding dress, she is definitely the person to trust with it! Jane did such an amazing job and helped in the short time that I needed my dress done. She went above and beyond to make sure my dress was perfectly done and I could not be more happy. Thank you! Jane is the sweetest – booked a last-minute appointment because I was worried my bridesmaid dress was too long, but she showed me exactly how to wear it and tie the neck so it was the perfect length! She even gave me a plastic garment bag to take my dress home in! I know exactly where to go next time I need something altered. Thank you! Jane is simply amazing! She managed to do miracles with my wedding dress in just two weeks before I leave for my destination wedding. I thought my dress fit before I got there and that it just needed a little hemming, however I was wrong and she made sure it fit like a glove, made it perfect for my barefoot ceremony, and added the most beautiful bustle for after the ceremony. She made sure to show me exactly how to bustle it also and the little tricks to make the bustle invisible. She also saved my dress from being stained due to my own clumsiness! Her prices are very fair and I cannot recommend her enough, if I ever need and other alterations done you better believe she is the only one I will call. Thank you so much Jane!!! Jane is incredible. I was in a panic as I got my dress in NJ (where I’m originally from) and had all of my alterations up there but needed to ship the dress to Texas and get the final fitting here. Jane was totally open and okay with finishing the project. I did need a bit taken in still so Jane quoted me fairly and was able to get it done perfectly in time. Once I saw Jane’s prices and work, I wished she had been altering my dress all along! So so happy with her services, would recommend to anyone in the San Antonio area. I appreciate the beautiful job you have done on my dress ! Jane was amazing! Flawless work. She took my wedding dress when others told me it was too late to start alterations. 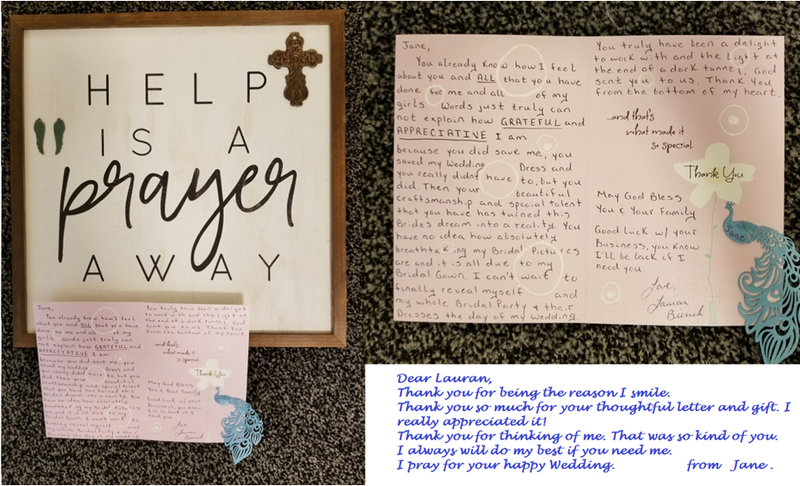 She worked with my schedule and made sure everything was perfect for my big day. Highly recommended. If you need alterations definitely see Jane! I was really nervous about the alteration process for my wedding dress but Jane was so wonderful and sweet through out it all. Any questions or concerns I had she was quick to address and to give helpful suggestions. I wanted to add in some off the shoulder sleeves and when it was all done it looked like the dress came with it originally and not an addition. My dress fit like a glove and I couldn’t have been happier. If you need alterations definitely see Jane! Highly satisfied with my alterations! Highly satisfied with my alterations! Jane was very pleasant to work with and she made all the changes I wanted. 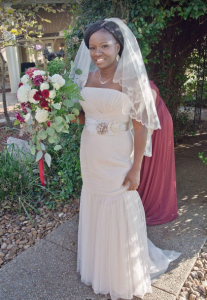 I started with a size 16 dress, so it was very large all over, and she was able to perfectly alter it down to a 10! The work was very high quality and I would recommend her to anyone! I STRONGLY recommend her whenever you need any alterations done. Jane is AMAZING! I originally came to have my bridesmaid dress altered. She was able to make it fit my body size perfectly. She worked well with me, was patient, she was able to get me in quickly. She worked with everything I needed her to do. I STRONGLY recommend her whenever you need any alterations done. She has such a sweet and calming soul. She shares the vision you dream up and it is wonderful. I ended up falling in love with a wedding dress (saving it for a day) and she altered the top area for me, IT WAS PERFECT! Now I am actually getting married and I have no doubts about where I am headed for alterations again!!! JANE IS THE BEST!!!! Jane does awesome alterations at a reasonable price! Thank you so much for making me feel beautiful on my wedding day. You took the time to ensure my dress fit perfectly, explaining what would look good and what wouldn’t, and just being sweet and patient with me. Thank you again for making my wedding day memorable! I had my wedding a few days ago. So I have to write the review right away because Jane has deserved it. 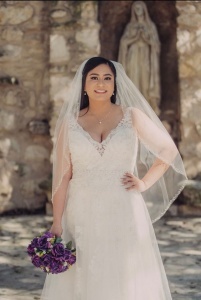 I bought my Maggie Sottero gown from Bridal Galleria in San Antonio but I only had about a month to the wedding and they said do not offer alteration services and I would have to get my alternations done elsewhere. I found sew wedding dress & alterations through online search. I was stressed out because my dress was a bit complicated with all beading covering the entire dress. It was heavy and I was afraid I made the wrong decision on the dress. I called Jane and she said come bring the dress. From the moment I walked in I felt relief. She is a professional and knows the bridal craft. She pinned the dress and said no problem I can move the zipper to accentuate your back curve and every thing is going to be fine. Well it was . She did an amazing job. Dress fit like a glove, she also put a custom bustle in the back for after the 1st dance to make my life easier. She added the underskirt I had sawn onto the dress to make my life easier and it sure did. She steamed the wrinkles out prepped the dresses and veil. She was patient and her demeanor is professional and kind. She showed 2 of my girls how to bustle the dress. She is flexible with appointment times and made the process painless. Honestly God sent ! Price was very reasonable and service top notch. Thank you Jane you saved me ! Highly Recommend! Jane is super nice and Helped me out So much! HIGHLY RECOMMEND!!!!! Jane is super nice and HELPED me out So much!! I’m a bride getting married in a few weeks and recently found out I was expecting! 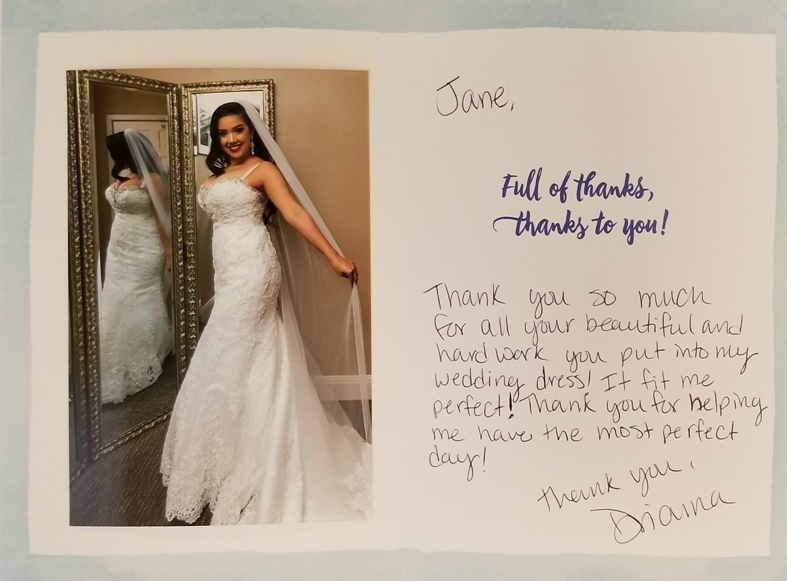 Originally I was at David’s bridal getting my first alterations done but when I had went back for my fitting I had not fit anymore around my stomach area. David’s bridal were SO rude and did not even want to help me out after paying so much money with them! My fiancé’s sister and mother found Sew Wedding dress and alterations and suggested I give it a shot. I called Jane and she told me to set you an appointment and would love to help me. I was so afraid that I would not be able to get it situated. Went in and out my dress on and right away Jane knew exactly what she was going to do. I told her I needed the dress before November ended to take bridal pics and she did not hesitate to get the job done. Went in for my fitting and to see what she did and OMG she did such an amazing job! She made it adjustable just in case I were to grow more than I already was, which I think is super cool! She did something a HUGE named brand company couldn’t do and I cannot be more thankful for her. Plus her prices are nothing compared to what I spent at David’s bridal. If you ever need any alterations or stuck in a situation go to Jane! She will definitely not disappoint you! Thank you again Jane and I cannot wait to wear my dress! Her prices can’t be beat and her work is top notch!! Flawless experience! My original seamstress for my wedding dress canceled on me last minute and I found Sew Wedding Dress and I’m so glad I did. She took me in the next day no problem. She’s so sweet and professional. Her prices can’t be beat and her work is top notch!! I took a bridesmaid dress as well as my mother’s dress for the wedding and she did a fabulous job on them as well. Highly, highly recommend. I got my wedding dress fixed by Jane. It came out great. Jane is super nice and attentive. She is very professional. Jane is super nice and attentive. She is very professional. I had great experience with her from the first message to the appointment to the end results. She makes everything very simple and stress-free. Her price is very reasonable. She will give you her professional opinion on what to alter. She won’t pressure you into doing any changes. If you wish to take her suggestions, that’s when she will put it into her order. I love how my dresses came out! They look amazing. Perfect fit on me! I chose Jane based off all of the amazing reviews. I was looking for someone to do my bridesmaid dress alterations, and I chose Jane based off all of the amazing reviews. I was SO HAPPY with her work, her timeliness, and her cost. My dress was done exactly 2 weeks later as promised. I highly recommend her if you’re looking for someone to do alterations. I trusted her skill and judgment the entire way, and she did a phenomenal job. Jane is incredibly detail oriented and kind. To find someone you trust to alter your wedding gown is a godsend. I found Jane through Google and read all of the heartfelt reviews. I was not disappointed!!! I trusted her skill and judgment the entire way, and she did a phenomenal job. She is the most reasonably priced and her work is top notch. Jane is a perfectionist! She basically made me an entirely new wedding dress. She took my size 10 dress down to a size 2. She perfected the bust to ensure I was happy with it. She also added a beautiful and discreet bustle. I’d recommend Jane to anyone needing tailoring, big job or small job. She is the most reasonably priced and her work is top notch. Her work is absolutely gorgeous ! Jane, Full of thanks, thanks to you ! I went to take my pants altered because they were too long, and Jane was able to do this as well as fix my loose button and make other small changes that made all the difference. Absolutely recommend her. She responds very fast and has great pricing too… but overall she is just fabulous and her business feels very cozy and comfortable. Now I know where to go to next time I need adjustments. Trust her with your dress! Jane is the sweetest and she did a fantastic job on my dress which I thought might be a lost cause. Trust her with your dress! I was so thankful for her service before, during, and after and would recommend her to ANYONE in San Antonio or even Austin! Her work is beautiful and timely, not to mention very well priced. We highly recommend Jane for wedding dress alterations. We needed alterations and bustling for my daughter’s wedding dress. Her work is beautiful and timely, not to mention very well priced. We had a slight emergency with the corset just a few days before the wedding, and Jane fit us in and quickly got the job done. She saved the day! I also used her for my mother of the bride dress and my daughter’s bridesmaid dress. Jane was professional, had great ideas and was able to alter the dress as promised. Jane was fantastic. Every appointment she was waiting for us and gave us her undivided attention. 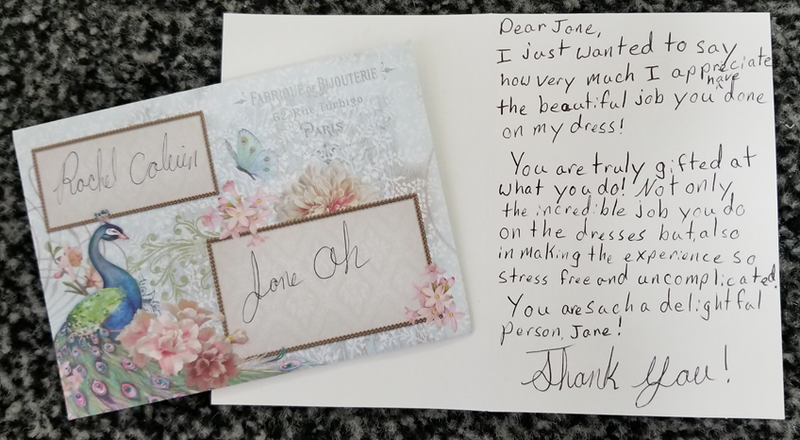 Jane completely altered my daughter’s wedding gown on short notice for a wedding out of the country. Unhappy with the dress my daughter purchased from a wedding gown shop, Jane was able to transform the gown into a beautiful yet functional and comfortable wedding dress. Jane was professional, had great ideas and was able to alter the dress as promised. The dress was ready when promised. The price was also very good. We would highly recommend her! Great prices, friendly attitude, flawless work. Jane is an amazing seamstress. She is kind, knows what she is doing, and completed the job in a timely manner. She did an amazing job with my wedding dress and I can’t wait to wear it on my wedding day! If you are look for someone to alter your wedding dress, Jane is the woman for the job. Great prices, friendly attitude, flawless work. Jane is an expert in wedding gown alterations. I thought my wedding dress was beautiful when I bought it, but after Jane altered it, I liked it 100x more !! Fits perfectly, the bustling in the back makes it look do elegant, and she even hand-made me a sash with a bow in the back. Thank you soooo much Jane. I am a client for life…highly recommend for any alteration needs. Jane is the best so nice and professional! Highly recommend. Thank you Jane for altering my mothers dress and doing the bow on my nieces dress!!! I cannot wait to see how it will look on everyone!! Jane is the best so nice and professional!! Highly recommend. Her prices are unbeatable and her work is exceptional! I bought a wedding dress that is very expensive and cost thousands of dollars dress. I wanted to see if I could save money on the alterations and find a budget friendly, good quality seamstress who could do the alterations for my wedding dress because all the wedding dress boutiques are super expensive and charge $400 or more just for hemming so I found Jane on sewweddingdress.com and her work seemed pretty impressive. I was nervous and very worried to leave my expensive dress with just any seamstress but she really put me at ease when she showed me what she would do with my dress and how. 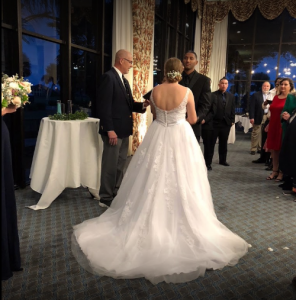 She had to hem my dress which is no easy task because I have like 5 layers of material and very intricate lace, she had to pull in the bodice, pull in the hips and a lot of other things that needed to be done and she did everything perfectly and she saved me hundreds of dollars! Her prices are unbeatable and her work is exceptional! I highly recommend her! She is trust worthy, offers amazing prices, service is excellent, and quality of her work is top notch. Jane is the best! She did a fantastic job with my wedding gown alterations. 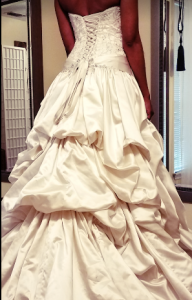 It fit perfectly and I was very comfortable on my wedding day. I regularly go to them for all of my alteration-related needs, especially now that I live nearby..